No one likes to starve while waiting on a whitetail. Here are the top 5 treestand snacks for beating the hunger this deer season. Regardless of whether you carry a small fannypack to the treestand or large-capacity daypack, chances are good that you pack a snack. And if you’re one of those all-day sitters — a good idea during the whitetail rut, or when heading-for-lunch hunters are pushing deer — having food on stand helps you stay warm and keeps you focused on bucks instead of your growling belly. During my 40-plus years of deer hunting, I’ve brought a wide variety of foods into the forest. Twelve-year-old me remembers Dad instructing on how to pack for a day spent stand hunting in Minnesota’s north woods during November. Turkey and ham sandwiches in hamburger buns, hard-boiled eggs (shells peeled in camp), bite-sized candy bars saved from Halloween and a small water bottle. Of course, the trick in order to enjoy the treat was timing. With typical temps of 0 to 25 degrees, not all foods survived the cold in the same manner. Example: Unless you wanted a slushy — or worse — you’d better drink your water by noon. Below are my top five treestand snacks. Perhaps I regularly carry something you haven’t considered? My two favorites are Nature Valley Sweet & Salty Nut and Quaker Chewy Peanut Butter Chocolate Chip. Filling, good for you (sort of) and tasty. 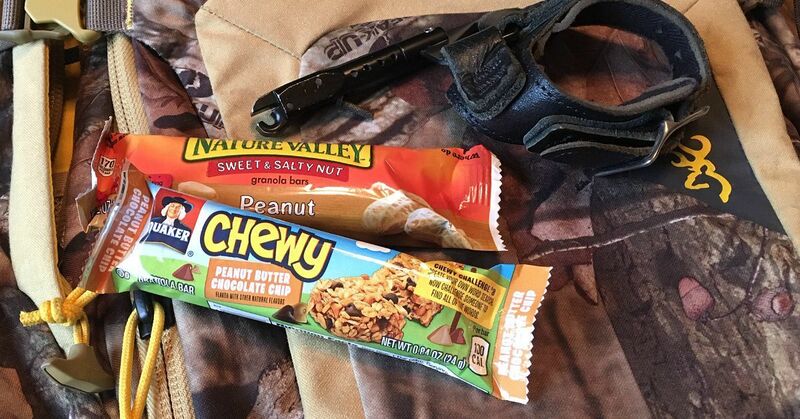 You can never pack too many granola bars in the treestand. Tip: Take the bars out of their original noisy wrappers and place them in a single zipper sandwich bag. You can fit a bunch of bars in one bag. That way, you won’t spook nearby deer with loud wrappers, and you eliminate trash in your pack. Buy granola bars in large quantities so you never run out. I live on these two types during deer season. My buddies often add jelly to build PBJs, but I simply spread margarine on one slice of bread and lots of Jif Creamy on the second slice. The margarine makes it taste even creamier. Tip: Cut the sandwich in half. Eat half during late morning, then the remainder during mid-afternoon. It’s better to keep fueling the furnace with several small portions than one big noontime feast. Eating a whole apple in the field is noisy and messy, and then you have to deal with the core. Don’t mess with it. Cut the apple into a handful of slices and then place them in a zipper sandwich bag. Tip: If you’re still buying Red Delicious apples, then you need help. Serious help. Perhaps the greatest marketing spin name of all time, Red Delicious apples are anything but delicious. You have so many great apple varieties from which to choose: Gala, Fuji, Braeburn and my No. 1 favorite, Honeycrisp. Red Delicious apples should be renamed to something not fit to print. Buy a better apple; this Honeycrisp is a great choice. I like dessert at every meal. Yes, pouring Lucky Charms into leftover milk after eating Frosted Mini Wheats counts as breakfast dessert. During severe cold, candy bars such as Snickers can freeze and become difficult to eat; you don’t want to break a tooth and drive to the dentist instead of the taxidermist. Better options for frigid conditions include Kit Kat, 3 Musketeers and my absolute favorite during deer season, Pearson’s Salted Nut Roll. Basically peanuts and frosting. Nibble off the peanuts first, save the frosting for dessert. Tip: While I love Reese’s Peanut Butter Cups, they're fragile. The same is true for Kellogg’s Pop-Tarts (basically breakfast candy). Unless you want to try pouring crumbs from a Ziploc into your mouth, it’s best to pack snacks that hold their shape while bouncing around in your pack. I mentioned this one previously. This old-school staple has largely been forgotten by millennial deer hunters. As my dad would say, “An egg sticks to your ribs.” I’m guessing that’s not true, but I agree that eating an egg satisfies my hunger in the treestand. Tip: Peel the shell in deer camp. After all, you don’t want the same fingers touching your egg that poured doe-in-heat on a scrape — the reddish skin stains might look like Tabasco but it’s not. Save the egg for noon snack, and wash down the yolk with water. Hum the theme from Rocky as you chew for motivation to stay on the stand until dark. There you have it — my top five treestand snacks. Deer sticks. Delicious, but I think if I can smell the food easily, then deer might, too. Plus, whitetails — especially mature bucks — seem to have a sixth sense for avoiding contact with hunters. Eating a deer while sitting in ambush and trying to kill a deer seems like bad karma; a wary whitetail might somehow pinpoint this carnivorous vibe. Trail mix. Good tasting, no doubt, but a bit messy/difficult to eat while wearing gloves or mittens. Sunflower seeds? Give me a break ... you aren’t watching a baseball game. You’d be as annoying as that chattering red squirrel one tree over. Baby-cut carrots. Easy to pack, hold their shape, tasty and good for you. All pros, right? Not so fast. What if you accidentally drop a carrot to the base of your treestand? Is that baiting? Pack smart, eat well. Good luck for the remainder of the 2018 deer season! Long sits on a treestand are made more tolerable with plenty of tasty snacks. The author had just finished lunch in his stand when this South Dakota 5x4 paid him a visit.